Sometimes I think I look for recipes that use puff pastry just so I can make something fun with the second sheet of pastry. I can’t even remember what I used the first sheet for anymore, but for the second, I had planned all along to make an apple tart. Nothing fancy, mind you, but a rustic, thrown-together version. I admit, it’s quite possible that my secret plan all along was simply to make the tart, under the premise that it was to use up the extra puff pastry. Yes, this dessert is better-suited to fall or winter, but it’s been cool and dank, and apples still abound in the stores. A homey dessert was just the ticket after an absolutely rotten week. This is yet another recipe taken from Everyday Food, which I seem to be obsessed with lately. Preheat oven to 375*F. Line large rimmed baking sheet with parchment paper. On a floured surface, roll out the still folded puff pastry to 8×14 inches. Trim edges with a paring knife to form a rectangle. 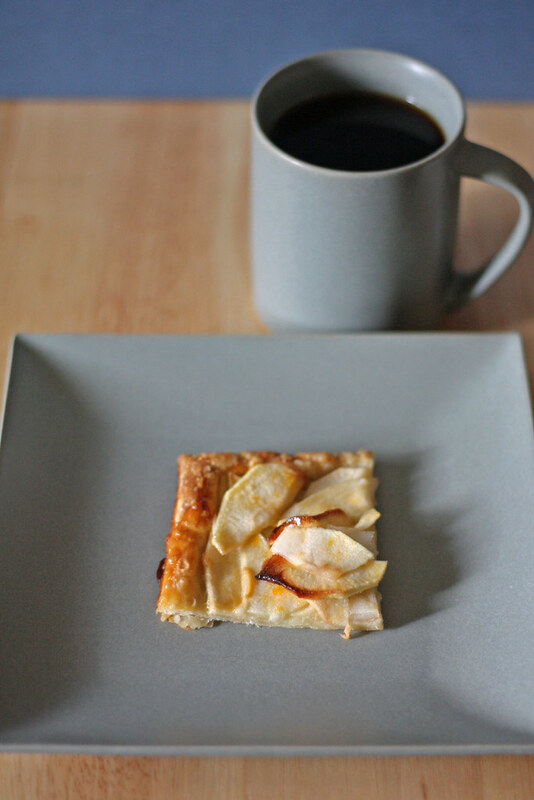 Using the knife, cut a ¾ inch border around the pastry, being careful not to cut completely through. Use the rolling pin to transfer the pastry to the baking sheet, place the sheet in the freezer. Toss the apple slices with the sugar in a large bowl. 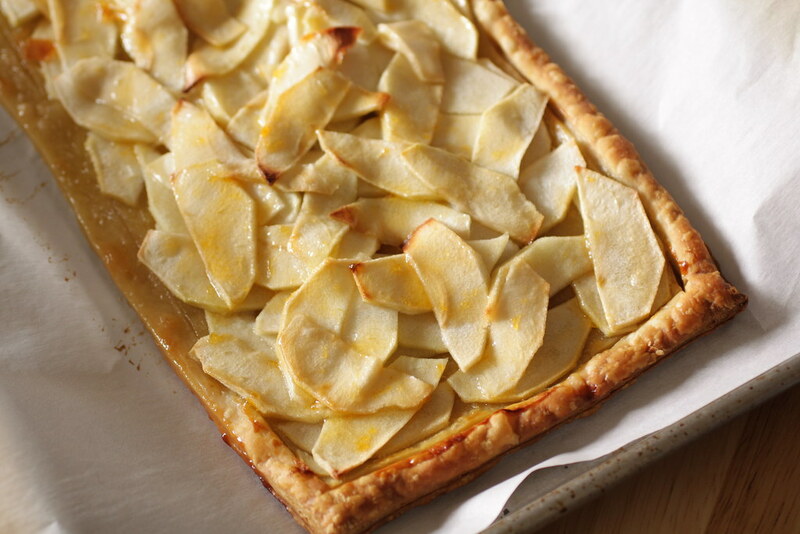 Brush the pastry with egg wash inside of the border and pile the apples within the border. 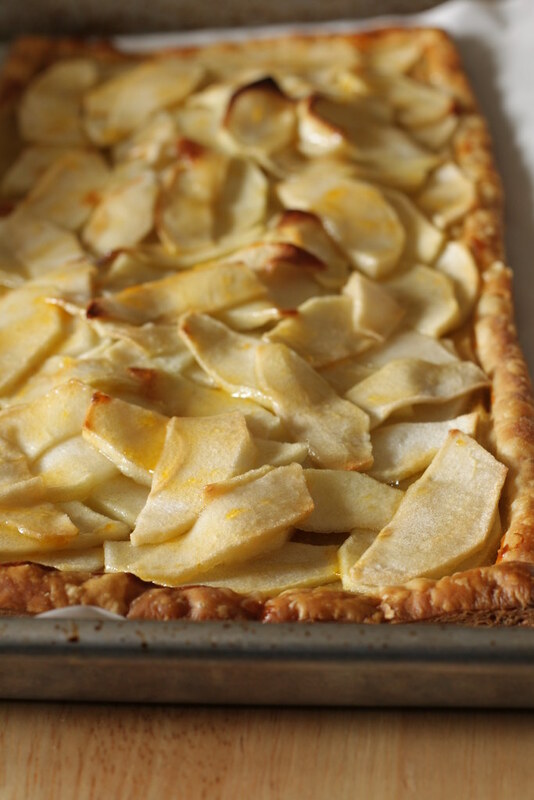 Don’t worry about getting fancy with the apple arrangement – remember, this tart is rustic! Place dots of butter on top of the apples. Bake for 30-35 minutes, turning the pan halfway through baking. Don’t worry if some of the butter/sugar runs off the edge of the tart and makes a mess – this dessert doesn’t need to be perfect. Brush the apricot glaze on top of the apple slices. Serve warm or at room temperature. That looks great together with my coffee now. Happy Easter!